Beautifully engraved certificate from the Kalamazoo, Allegan and Grand Rapids Railroad Company issued in 1888. This historic document was printed by American Bank Note Company and has an ornate border around it with a vignette of the Michigan State Seal. This item has the signatures of the Company's President, Jeptha Wade and its Treasurer, W. s. Jones and is over 118 years old. Kalamazoo, Allegan and Grand Rapids Railroad Company was formed on June 3, 1868, by consolidation of the Kalamazoo and Allegan Railroad Company and the Kalamazoo and Grand Rapids Railroad Company. Leased on September 21, 1869, to The Lake Shore and Michigan Southern Railway Company for the term of 999 years. 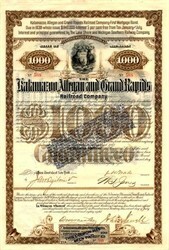 The Kalamazoo and Allegan Railroad Company was incorporated June 18, 1867. The Kalamazoo and Grand Rapids Railroad Company was incorporated January 3, 1868. Jeptha Homer Wade (August 11, 1811-August 9, 1890) was an American industrialist, philanthropist, and founder of Western Union Telegraph. Born in New York state, Jeptha Wade was a Cleveland, Ohio industrialist who was responsible for the consolidation of most of the telegraph industry by forming Western Union through a series of acquisitions and mergers. By 1847, he became interested in the telegraph industry and worked as a sub-contractor. He constructed a telegraph line between Detroit and Jackson, Michigan, part of the Buffalo and Milwaukee Telegraph Company and the first line in operation west of Buffalo, New York. He moved to Milan, Ohio in 1849, where he established a telegraph office, organized the Cleveland Cincinnati Telegraph Company, and utilized the Morse telegraph system. Wade soon became an agent for the Morse system with an office in Columbus, Ohio, where he lived after 1850. Subsequently, Wade built telegraph lines through the midwest and west. He developed a network of telegraph lines known as "Wade lines" that stretched from St. Louis to San Francisco. In 1857 he moved to Cleveland where he was a director of several railroad companies and an incorporator of banks and business enterprises. In 1861, Jeptha Wade joined forces with Benjamin Franklin Ficklin and Hiram Sibley to form the Pacific Telegraph Company. With it, the final link between the east and west coast of the United States of America was made by telegraph. In 1866, he served as president of the Western Union Telegraph but after one year resigned for reasons of health. Wade used his vast wealth to benefit his community of Cleveland, Ohio. In 1882, Wade donated 72 acres (291,000 m�) of land east of the city for purpose of creating a park, which was named Wade Park in his honor. Wade also was heavily involved with the formations and establishment of Hathaway Brown School, a private academy for young girls and women; he also co-founded the Case School of Applied Technology, now part of Case Western Reserve University. In addition, Wade served as the first President of the Board of Trustees for Lakeview Cemetery on Cleveland�s east side. Mr. Wade also served as vice president or director of a number of public institutions such as the Workhouse and House of Refuge, the Homeopathic Hospital, and the Cleveland Protestant Orphan Asylum. 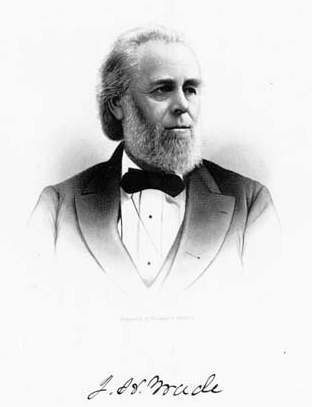 Jeptha Wade was instrumental in the founding of Case Institute of Applied Science in 1880. In 1881 Wade gave the City of Cleveland seventy-five acres of land near East 107th Street and Euclid Avenue for a public park. In 1882, it was deeded to the city.